A “nice” pocket knife is something I always wanted but never really bought myself. Sure I have bought a lot of knives over the years but they were all on the low end of the cost scale. Some of those cheap ones have been good ones. I have been carrying the same old Gerber para-frame for about six years now and it was used when I got it. It has been a very good knife and has served me well. It is still a solid tool and it locks up tight and straight and keeps a decent edge. There is also the advantage of not having to worry too much about using it for rough, possibly damage inflecting duty. I guess have just reached the point in my life where I feel I can finally treat myself to a “nice” everyday carry knife, but what to buy? Thus began my quest for the ultimate EDC folding knife. As a youth back in the 90’s I bought a lot of the knife magazines and always lusted after the high end brands. Still I couldn’t bring myself to spend $100 plus on a knife. 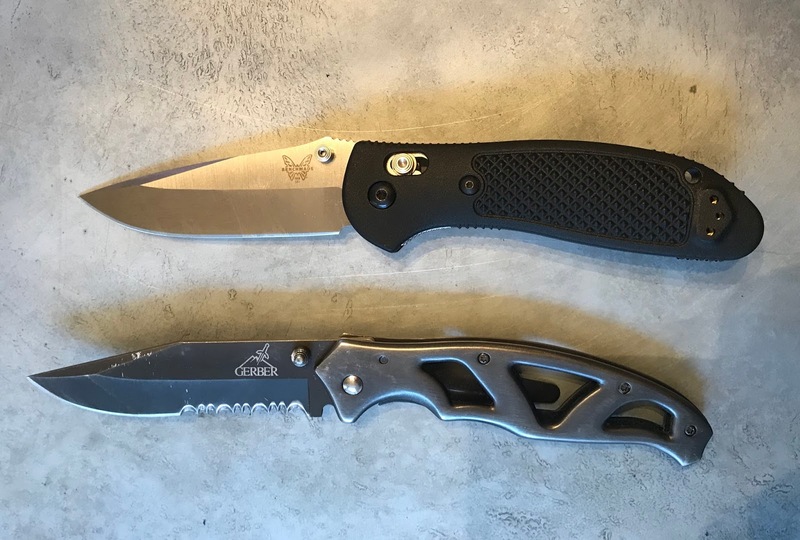 A lot of the manufacturers that were on the “high end” back then are the same ones churning out the mass produced unbelievably low priced knives found at Walmart and other bargain retailers. A lot of them seem to have sold out their brands in the name of profit. Don’t get me wrong I’m sure a lot of them are good knives but the names do not command the respect the way they used to. Most still make their high price knives in the USA and contract out the diluted lower end models out to China. SOG is one that comes to mind because I remember them being way out of my price range but super high quality back then. Now you can pick one up for twenty bucks a Wally World. Over the past month or so I have done a lot of research and listened to a lot of opinions and preferences. 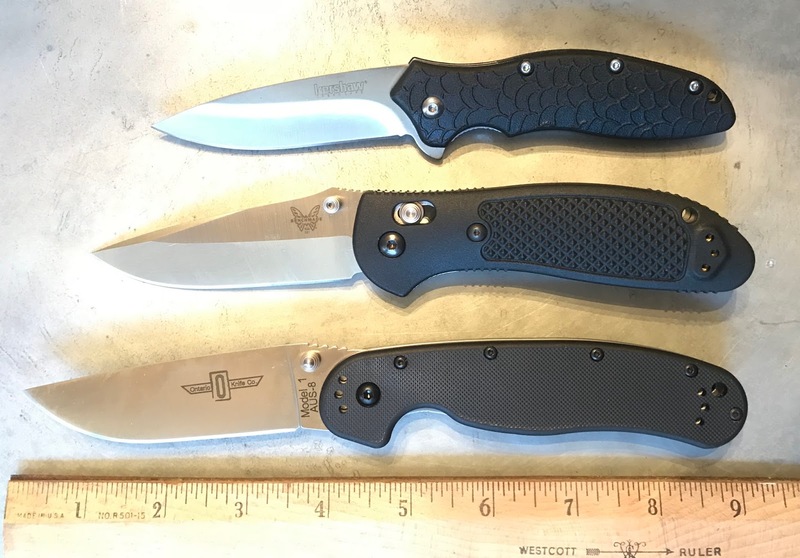 Two of the brands that rose to the top consistently were Benchmade and Spyderco. Also both these companies seemed to have maintained their good names quite respectively. Kershaw also had some really nice highly reviewed models in their massive lineup. There were also some new manufacturers such as Ontario knives and Zero Tolerance that are giving the establishment a run for their money. I would probably fall in love with Spyderco if I ever tried one but there’s something about the thumb hole look that I never liked from a purely aesthetic opinion. Also there are so many cheap imitations of Spydercos out there I think it has skewed my intuitive opinion of them. People who like Spyderco REALLY like Spyderco, they almost have a cult following. It reminds me of the some way people are so devoted to Apple products. I always thought the obsessively single brand minded Apple users were nuts until I actually owned an Apple product and wondered why I hadn't drank that Kool-Aid long ago! Anyway I am still not feeling that warm and fuzzy for the king of thumb-holes yet. After all was said and done I finally narrowed it down to one knife that seemed to be the either number one or close to it on most knife guys lists of EDC favorites, the Benchmade Griptilian. I also liked the lifetime free sharpening and cleaning service offered on all Benchmade products since I had never mastered that art. I wanted something close to the size of my old Gerber so the full size Griptilian model fit the bill. At $102.00 it was not the highest price range but still seemed to compete or defeat most of the two to three hundred dollar models. The only contention I saw for some people was the glass-filled nylon grips. For me Glock had long ago dispelled any aversion I might have had to "plastic" parts. Even before that my Remington Nylon 66 had been as tough or better than any of my wood stocked guns and was less likely to crack like the wood ones had a tendency to do. I ordered the Griptilian from Amazon and while the knife shopping bug had bit me I decided to try a couple of the close contenders that were significantly lower in price and would make good benchmark comparisons to the Griptilian. I Ordered the Kershaw 1830 OSO Sweet Pocket Knife ($17.27) and the Ontario 8848 RAT Folding Knife ($27.03). Both of these had gotten stellar reviews as well. 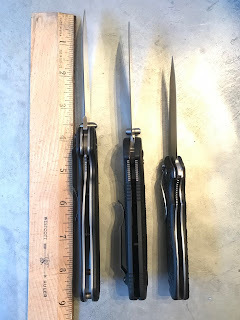 I received all three knives earlier this week and thus far all three are really solid knives with a quality feel and action. As far as long term use, edge retention, etc. I will keep an update on here as time goes on and I have a chance to carry all three for a while but here are some first impressions. The Benchmade came in a nice box with a little velvet storage bag. The Ontario came in a lighter weight box and the Kershaw was in a clear plastic "blister" pack. 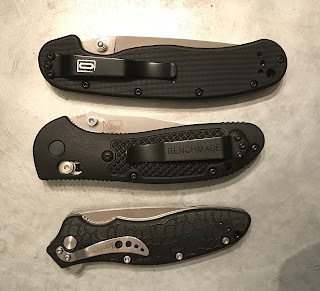 I think the Benchmade may be the sharpest out of the box of the three but all came really sharp. I also think size and looks-wise the Benchmade beats out the other three for me but only marginally so. All three fit the hand pretty well. The Griptillian has excellent ergonomics and grip characteristics as the name would imply. The Ontario RAT has a flatter more basic grip but it is very substantial and sturdy and holding it feels like you are holding a nice fixed blade knife. The weight of it is a little more also. The one down side for me I did notice with the Ontario was it has an open post design along the bottom of the handle which is supposed to be for easy cleaning. The Gerber Paraframe also had an open post design however I noticed if I carried it in my pocket with loose change the coins would sometimes get stuck between the posts which in turn meant edge of the coins would rub against the bottom of the blade and dull the edge. I had to be careful how I carried it and will have to do the same with the Ontario. The Griptillian opens very smooth but is not an "assisted " opener. The only assisted opener of the three is the Kershaw. With a little practice you can open the other two just as quickly using the thumb stud but you have to be careful with your finger placement. The Kershaw opens by pressing a small lever on bottom but it was really tight and a hard to press right out of the box. Once you get it activated it opens quick and smooth. I think it will loosen up and open easier after a little bit of use. I found that the Griptillian can be opened with the flick of the wrist but I think doing so might be a little rough on the locking mechanism with the force of opening it that way. As far as closing the Griptillian is the easiest to manipulate one handed. You just pull the button down with your thumb while pressing on the top of the blade with your index finger. The other two I find myself pushing the back of the blade on the side of my thigh while pressing the lock to close like I used to do with my old Gerber. This frame lock mechanism on the Ontario and Kershaw is simple but reliable and the Griptilian uses Benchmade’s axis lock which is also well proven. Pocket clips are changeable for lefties on all and the Ontario has two extra mounting options at the opposite end of the knife. The pocket clip on the Kershaw was so tight I couldn't get it on my pocket, I will have to try and pry it out a little. 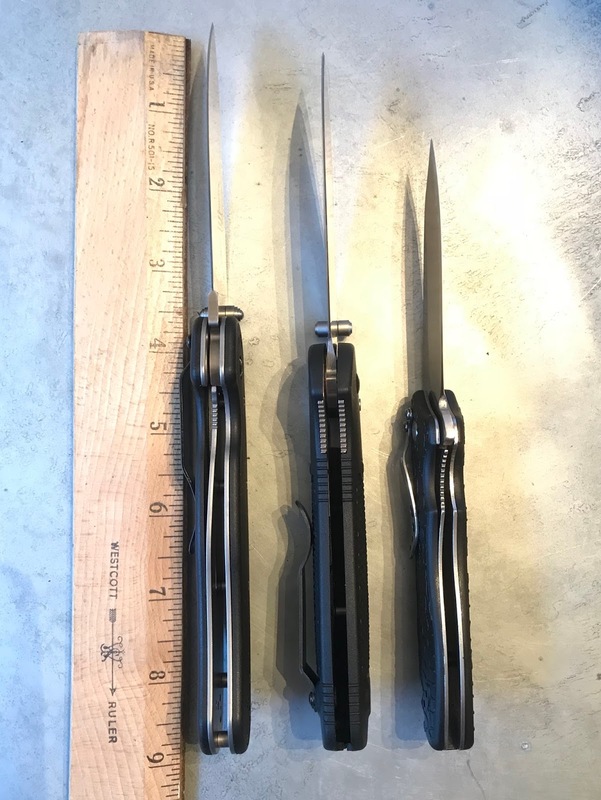 Below are some pictures for visual and size comparison as well as specs for each knife. The last Griptillian that I looked at in a store had a slightly asymmetric grind... which is unacceptable coming from Benchmade. The Paraframe is garbage... dollar store multitools come with better grinds. Edges aren't perfect in the budget range. I usually hone off the factory edges in just hours after purchasing. Back in the day, cheap edges seemed to have a lot more quality and would last with a bit of touch up... nowadays the grinds are sloppy as hell and need to be completely reprofiled after I buy them. SOG Visionary II, in my pocket for over ten years. Everyone has an opinion on this, I guess this is Kind of like asking what is the best handgun for carry. Its Always the one your carrying. Of course! Regular old Ka-Bar fighting knife from 1960. 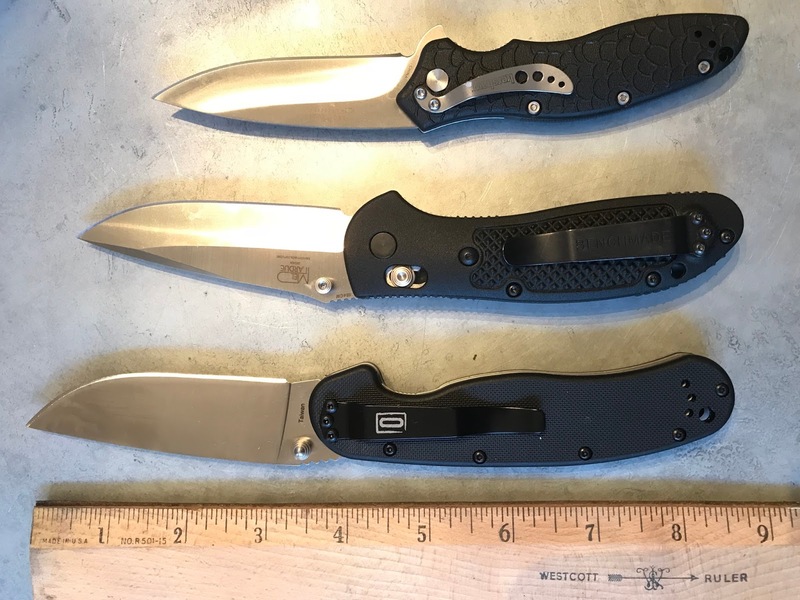 All these are decent knives but after a little carry and use the Benchmade Griptilian is undeniably in a different class. It is superior in just about every way. I was so impressed I bought 2 more Benchmades already! Why did I wait so long to get a quality knife! Now I'm spoiled and possibly addicted.